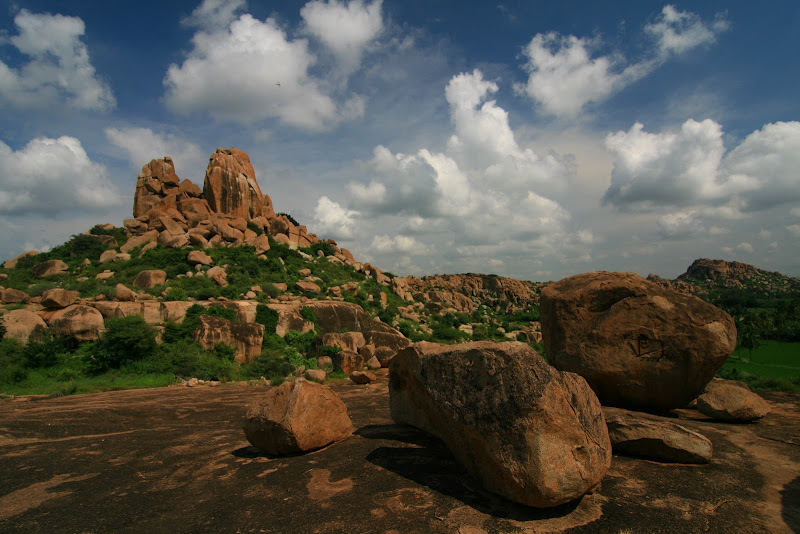 Our time in Hampi is still getting better and better. Until now, we could manage the first problems from the film 'Pilgrimage'. Yeehaa! Some highball action in the heat. I'm sorry for posting only one single picture, but the india internet doesn't work as I want to. 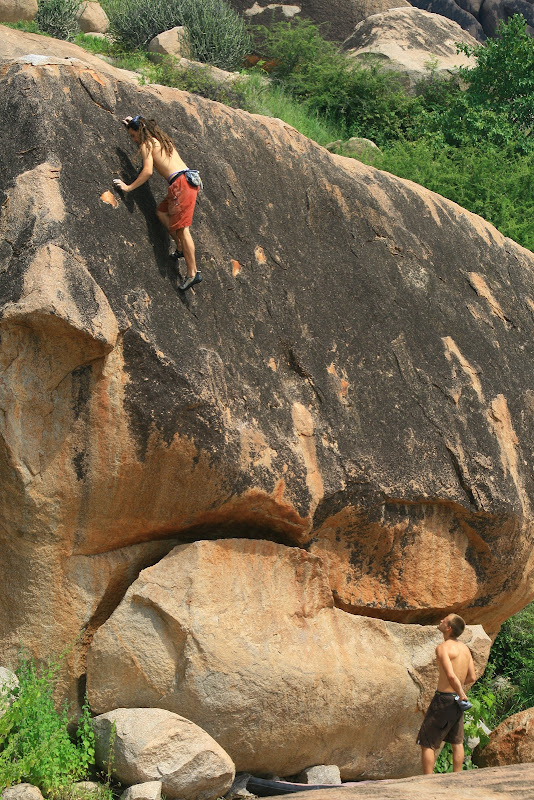 Stefan climbs an amazing ungraded line. after an awesome train-journey to Goa, we chilled at the beaches. This was the Hippi paradise number one! 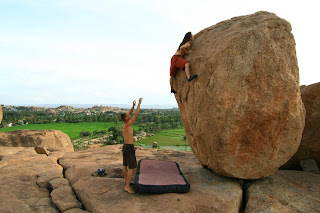 But we were psyched for bouldering and take the next bus to Hampi. These ride was horrible (! ), but we want to Hampi as fast as possible :-). And now here we here, in the boulders paradise. You can look were you want to, everywhere perfect shaped blocks. That's crazy! Now, after three days of climbing our skin is gone. But we couldn't stop to put our hands on these scary sharp crimps. Every line is perfect and it's impossible to pass them without giving them a try. I hope to blog some pictures anytime later. After 24 hours of arrival time, we are now in india. What kind of cultural difference! Our Hostel in Mumbai is pretty smal but fine. But in case of more than 30t people/square km it a palace. The city could only discribed with stress and rubbish. Today we made a little sight-seeing-tour with our private driver. His car was very special, because the engine stop very often by it self :-). He gives us a deep impression of what the word 'poor' means. Thereby we could arrange the next part of our trip, a 800km train jouney to Goa. Originally the train was fully booked but with some extra money they could find two free seats ;-). Let's see what comes next.